Conversations are happening around us all the time but do you realize how important each of these conversations is to your life? At the church I work at, we use caring conversation all the time; in our Confirmation program, in our Bible studies. But more than any of this, conversation is an important part of our homes as well. Now think about it! How many times a day do you find yourself engaging in a conversation? Maybe you are a parent and many of your conversations involve simply asking your children how school was or how their day was? Most of the time Ill bet you get a pretty morous answer; “ok”, “alright” or another one word answer. These conversations might be simple but it seems to me that eventually you will have to converse about the hard stuff; the stuff that neither one of you probably wants to talk about. Caring conversation is essential to all our relationships! If we can’t talk to each other, then how will we able to talk about the tough stuff? How will we be able to learn to trust each other if we don’t talk to each other? Our confirmation program and our faith milestones programs bring in every home of every child in that specific class. What has been absolutely amazing to watch is how important that time and those conversations are to the homes of this community of faith. WOW! I’ve seen divorced parents sitting at a table with their child TALKING to each other; not yelling, not arguing but simply talking to each other. What a wonderful example of why these conversations are so important! Too much of our lives these days are busy running from here to there to here again and back to there that we simply dont take the time to sit down together, we simply run through the drive-thru, grab supper, and head to our next activity. But the truth is we will get so much more out of our relationships and life if we take the time to talk. As I grow older, I have really come to appreciate and realize why I need “caring conversation” in my life. I think of my relationship with my own mom who lives in a nursing home because of her illness (she is manic/bipolar;had a nervous breakdown shortly after my sister was born almost 30 years ago) we dont have the most in-depth conversations. She isnt the mom I once knew. However I know that when I call her, it means the world to her. Our conversations may be short and brief but they have also allowed us to have the tough conversations. Recently a family member lost their child and I had to tell my mom. If it hadnt been for our “caring conversations,” I know this would have been much more difficult. So tonight give it a try; turn off the tv, sit down for supper and simply talk to each other. “Caring Conversation” can be as simple as sharing about your day today. Enjoy some “caring conversation”, make it a ritual, and then let me know what you think. Some interesting thoughts! I’m not sure if I have thought any of these thoughts but they definetely make me wonder about the question; WHY AM I STILL SINGLE? I know that I definetely yearn for a family, a husband, etc etc etc and I wonder if God would make me yearn for these things if they were never going to happen for me. I find myself saying NO WAY! God wants these things for you. So just wondering if maybe sometimes I inadvertently do think pessimisticly and maybe should start thinking more optimistic. I remember a conversation my colleagues and I had at work way back in September. They made me reframe what I pray for in my life etc. I also specifically remember one of them saying he hoped and prayed that someone would be put in my life who would bless me and who I would bless in return; “blessed to be a blessing.” I did join a local writing group to help with this and believe I have been blessed by attending it etc. However I still havent found someone I have that “connection” with and who we bless in return. I vow that I am going to try and think more optimistically as I wait to find my Mr. Right and no longer be single…..
1.Service!–My call to Diaconal Ministry is founded on service. I am called to pick up my basin and towel to serve all God’s people. I love helping others. In addition, hospitalily plays an important part of this as well. I love having others over etc. 2. Words (and Writing)–I love writing! I love putting words on a page; writing a story, poems, etc. It also is a huge form of prayer for me. Someday I would love to have a book published. 3. Relationships–My friends and family mean the world to me! I love spending time with them. It is important for me to say connected to all these people. I am blessed to have you in my life! It is important to me to be a good daughter, sister, friend, niece, etc. 4. “Grace through faith”–My Lutheran identity is a huge part of who I am and is so important to me. It isnt about doing the right thing or working to earn God’s love, its about grace knowing that God’s love is a free-unmerited gift given to me freely by God. I am reminded of the words of my colleague…he classifies it often as the “pure insanity of grace.” I love that; and thats why grace is so important to me! 5. Holy Spirit–The Holy Spirit always is there when we least expect it. There have been times in my life when I didnt know what was going to happen, etc but yet the Holy Spirit has been there in the midst of it all. Happy Valentine’s Day…..or for some, Happy Single Awareness Day! Today I was reminded of this love when a dear friend from the church I work at surprised me with chocolate and flowers. 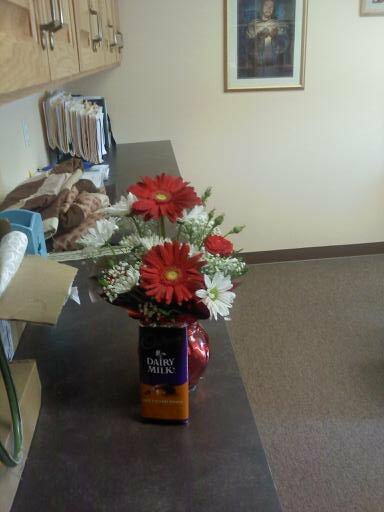 She was like, “I couldnt think of anyone who deserved chocolate and flowers more than you do.” She totally made my day! Thanks for putting a smile on my face dear friend! For today’s Friday Five, tell us about five people you love, people who will remain in your “heart” forever. 1. My Momma! She is one of the most amazing people in my life. I love her so much. Even though she lives in a nursing home and is 5 hours away from me, I think of her every day. I hate when I disappoint her but know she loves me unconditionally! Love you momma! 2. My Dad! My dad and my mom have always been there for my sister and I even after they got divorced. My dad is such a hard-worker and has instilled that in his girls. Someday I hope to find my Mr. Right and I have a feeling he will have many of the qualities I love and admire in my daddy. 3. My sister. I am so glad that I didnt grow up an only child (nothing against those of you who did) Andrea and I are very close. I love that since she is the younger sister, she talks to me about stuff….confides in me the older sister! I love our chats! I dont know what I would do without her. I love her with all my heart. I love you sis! 4. My Grandparents. Both sets are such an amazing example of love. Both of my mom’s parents have left us and are in heaven. They were married for nearly 63 nears. WOW! I miss both of them each and every day. My dad’s parents are both still on this earth. They are such hard-workers which is where I believe my dad got his work ethic and instilled that in us our girls. All my grandparents have always been there for us. Love you! 5. Aunts, Uncles, Cousins, etc. My family means the world to me! I know we dont get to see each other as much as I would like but I love you all with my whole heart. Miss you and love you all! There are many others I am so blessed to have in my life but since it asked for five, I kept it as five. I am blessed by wonderful friends, wonderful colleagues-in-ministry, teachers, etc. And of course God…God’s love will always be held in the depths of my heart. Thank you for blessing my life. You all know who you are! What are 5 perks/gifts of ministry for you? 1. For me, one of them is spending time and getting to know all the generations of the church. I love spending time with my youth. I love leading devotions with my Tuesday morning devotion group with ladies who are all over the age of 60. 2. Getting to travel; taking youth on mission trips, going to continuing education events, etc. 3. As the first Diaconal Minister, I would say a perk for me is getting to educate others about the roster. I probably never would have put this in this category but the more I think about it, it makes sense. I love sharing my story about being called to the DM roster of the ELCA! 4. A Somewhat flexible schedule. I spend a lot of time at the church but when I put in long hours, its nice to know that I dont have to rush back to the church the next morning right away. 5. Im a writer so preaching is a joy. However I definetely am not called to be a pastor and dont want to do it every week so a perk for me is preaching once a month. Just perfect for me!